This is one of our commonest and most easily identified damselflies, and is the earliest to be seen each year in this area. The adult flight period extends from May to August. It is found in most habitats except for the most exposed sites. It has a preference for small acidic lochs but is able to persist on many very dry sites that have become unsuitable for other Odonata. It is also quick to colonise newly created ponds. 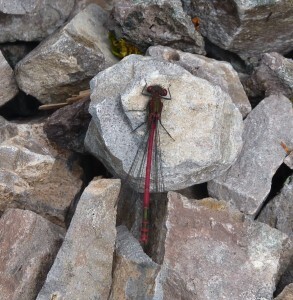 Both the male and female have a red abdomen with black markings. The thorax is black with red stripes, and the legs are black. Damselflies rest with their wings folded lengthways along their body (unlike dragonflies, which rest with wings outspread). During mating the male clasps the female by her neck while she bends her body around to his reproductive organs – the shape that this creates is called a mating wheel. The pair fly together over the water and eggs are laid within a suitable plant, just below the surface. The eggs hatch and the larvae, called nymphs, live in the water. Nymphs eventually climb out of the water up a suitable stem to emerge from their split skins as damselflies.